Enjoy Italian Cuisine at La Trattoria at Dreams Punta Cana! 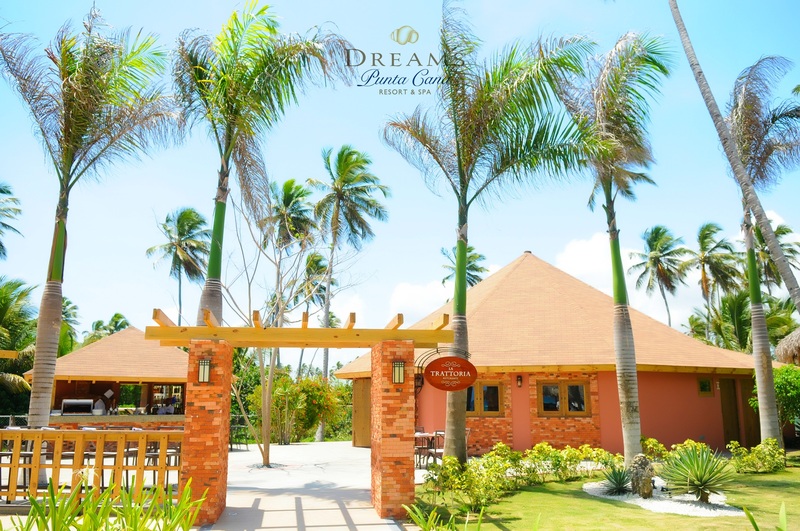 Explore the international array of specialty restaurants where reservations are never required at Dreams Punta Cana Resort & Spa where guests can choose from six à la carte restaurants, a buffet and a café! Your Unlimited-Luxury® amenities include all meals and today the spotlight is on La Trattoria Ristorante serving Italian Cuisine for lunch & dinner! . Hours for Lunch: 10:00 a.m. to 5:00 p.m: Outdoor only, La Trattoria is serving a variety of specialty pizza, either to take out or eat in! Guests can also enjoy the bar with unlimited drinks! Hours for Dinner: 6:00 p.m. to 11:00 p.m: Diners can choose to sit inside or outside and enjoy a marvelous a la carte meal with a variety of pasta options and gourmet pizza. The bar is still open too for an evening cocktail! Plan your stay at Dreams Punta Cana today with HOT HOT HOT savings! This entry was posted in Dreams Punta Cana and tagged all-inclusive, Delicious, Dreams Resorts & Spas, food, Italian, Pizza, Punta Cana. Bookmark the permalink.